This blog is about “beads” and “birds”. Mostly MY beading efforts and about my precious companion parrots. They are Oliver, Murphy, Tuce and Charlie. And we have a guest named Rita. I have been making some interesting pieces. The cuff below, soutache on shibori ribbon, is from a class given by Amee Runs With Scissors. http://ameerunswithscissors.com Amee is a fantastic teacher who not only writes excellent instructions, but also uses the latest technology to teach her classes. Everyone can see the close up of a technique on her screen as she is doing it. 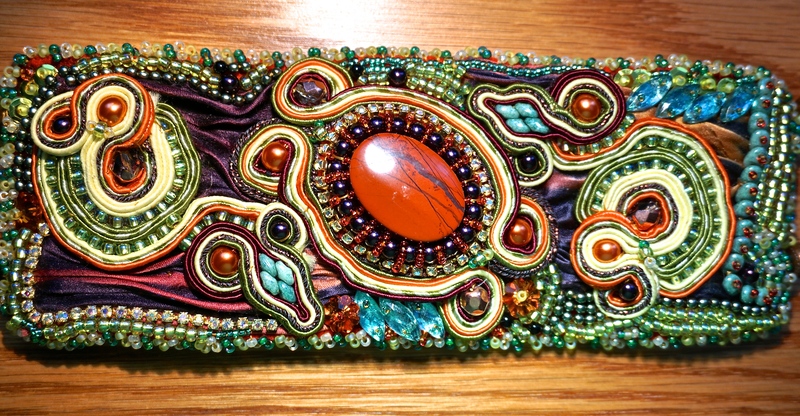 Amee provides the kit (I could never have put these colors together) and teaches the basic and some advanced soutache techniques and you make it your own with your filling in around the soutache. Some of my soutache is a bit wiggly, but I made a second cuff for a friend and it came out perfect. Of course, I forgot to take a picture of the second one. I call this “Kaleidoscope.” I used some vintage beads from www.agrainofsand.com/ for the extra embellishment. Now this cuff is my design and was a donation to a wonderful parrot sanctuary in Louisa, VA called Project Perry http://www.projectperry.com/ They had a fundraiser in the spring and I made this cuff for their auction. I called it “50 Shades of African Grey.” The Shibori ribbon name is Ashes and the center stone is a howlite. Lots of bling with Swarovski elements including a Swarovski red crystal heart and pearls and embroidered “feathers”. This has a wonderful clasp that I bought from Beads Gone Wild in W. Palm Beach, FL. With these two projects, I believe I finally found my “element” in bead embroidery. This precious fellow is my 40ish year old Congo African Grey named Oliver. Grey Bird Studio is his namesake. He came into my life in January of 1980, almost 36 years ago, and stole my heart. He is my best friend and has seen me through all sorts of life events, happy and sad. It is with heartbreaking sadness to write that he is dying of congestive heart failure. He was “hospitalized” for five days and my vet didn’t think he would ever be coming home but last Monday we did just that, brought him home. I have put him into home hospice care on my own. (I was a hospice nurse for people so I figure I am somewhat qualified) We have oxygen for him and modified his cage and play gym to accommodate his weakness. I cannot imagine my life without this precious guy and as he worsens, I will need to consider euthanasia. Right now his quality of life is less than good, but he eats and drinks and takes his medications and responds to me and my husband. He is such an easy patient. Many nights I prop myself up on the couch and he sleeps on my chest, over my breaking heart. It is this life event that motivated me to re-start my blog. In honor of my friend, Oliver. Posted on November 13, 2015 by greybirdstudioPosted in African Grey Parrots, Animal hospice, bead embroidery, Beaded cuffs, beaded jewelry, Beading, Jewelry making, parrotsTagged African Grey Parrot, Amee Runs With Scissors, animal hospice, bead embroidery, beaded bracelet, beaded cuffs, beading, beads, Beads Gone Wild, birds, crystals, embroidered bracelet, embroidery, euthansia, Grain of Sand, Parrots, seed beads, shibori cuffs, shibori ribbon, soutache, Swarovski crystal elements, vintage elements. Glad you are back! I have been interested in this style of bead embroidery. Your pieces are beautiful. Thank you Sanda. I am happy to blog again about my beading journey. Oliver is at peace, he is flying over the Rainbow Bridge. He was such a special companion and always oooohhh’d over my jewelry. He was my biggest fan and I will miss him horribly always. I am so , so sorry to hear about Oliver. That is a long time to have him in your life. How blessed you were to have that special little guy for so long. I am sure it will take time to heal. I am glad you have your beads to help you through. Being creative is the best therapy for anything !!! What a wonderful tribute to him to have your shop and blog named after him so he can go on through them !!! Thanks Stephie, I miss him terribly. I will post of picture of my memorial jewelry for him. I know that sounds weird but he was my best friend for a very long time. It does not sound weird. I think that is lovely you could make jewelry in memory of him and I would love to see pictures of what you made ! !